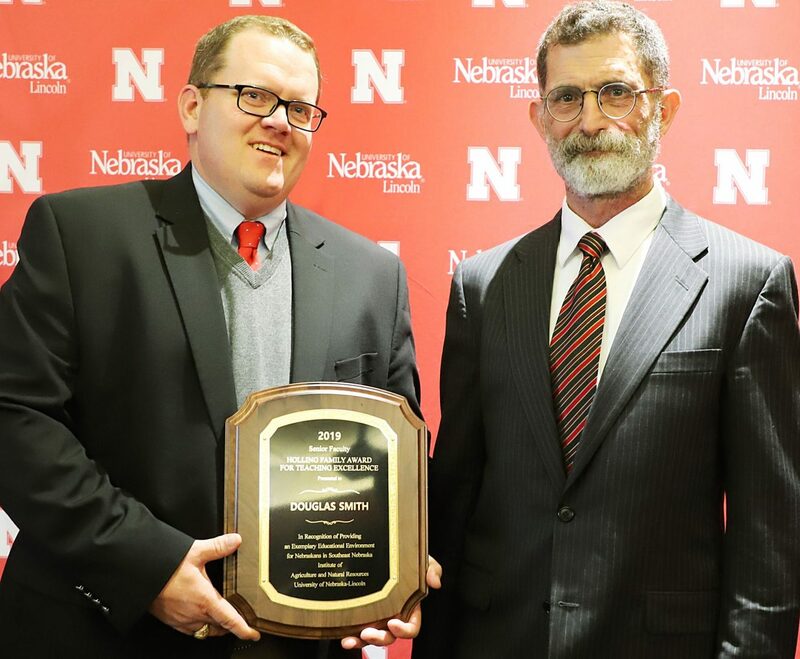 Smith was one of three senior faculty to receive the Holling Family Excellence in Teaching Award from the University of Nebraska's Institute of Agriculture and Natural Resources. "Dr. Douglas Smith embodies the outstanding work of our faculty here at the Nebraska College of Technical Agriculture in Curtis," said Ron Rosati, NCTA dean. "His work adds significant impact to NCTA Aggie students, as well as youth and adult education across Nebraska." Johnson is in her fourth year of an agriculture education program which began at NCTA, and is now completing her bachelor's degree at UNL. Next fall, she will student teach at Lyons-Decatur Northeast High School. "Doug has helped as an advisor, professor, and mentor throughout my two years in Curtis by giving students many opportunities and hands-on experience, including the bridging (from NCTA to UNL)," Johnson said. "He is someone I still look to for advice as I continue on my education, and will throughout my career." Smith earned his bachelor's and master's degrees from Sam Houston State University, and a doctorate from Texas A & M. He and his family moved to Curtis in the summer of 2011. Additionally, he is active in the Curtis community serving on the Medicine Valley Public Schools board of education and in the United Methodist Church. In November, he became the chair of the Nebraska Cattlemen's Education Committee.